Melania Trump looked professional and classy in a cream jacket and beige pants as she met with troops at Fort Bragg in North Carolina this week. 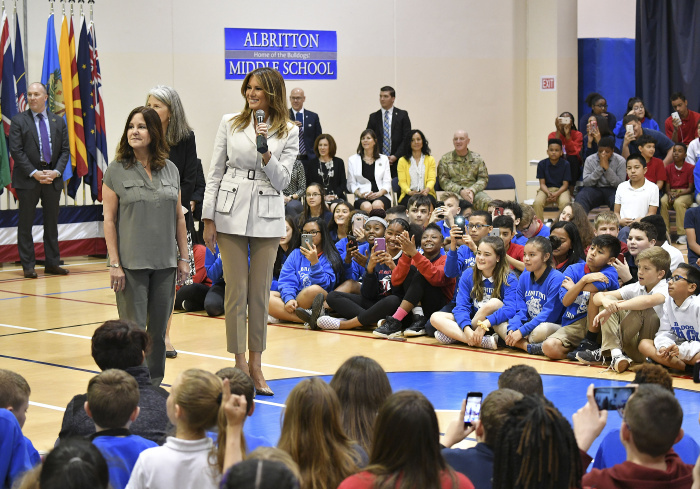 The First Lady was all smiles during the outing to the military installation, where she was greeted by members of the United States Armed Forces and their families. Standing tall in beige heels, Melania opted for a fairly neutral colour palette for the important occasion adding a slight pop of colour with a light pink lipstick and a touch of bronzer to her cheeks. While the President’s wife wore her gorgeous locks in their usual style, hanging loose and slightly waved, for the visit, with her nails painted white. Melania was joined by second lady Karen Pence for the trip to Fort Bragg where the pair met with commanders of the United States Army Special Operations Command. The pair also took time to visit the local Albritton Middle School and were treated to a lovely choir performance by students. Before jetting off back home Melania made sure to thank the men and women who serve the country, and their families who have supported them through difficult times. She continued: “To all the spouses here, my heart and appreciation goes out to you. With readiness as the top priority at Fort Bragg, I’m sure there is nothing more difficult to bear than to watch a loved one leave the safety and comfort of home to fight in dark and dangerous places around the world. 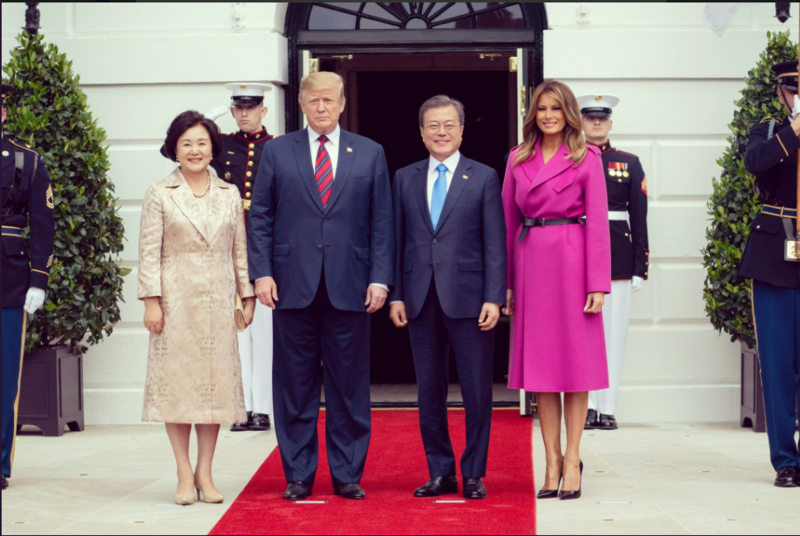 Melania’s visit to Fort Bragg comes just days after the First Lady welcomed South Korean President Moon Jae-in and his wife Kim Jung-sook to the White House alongside her president husband Donald Trump. The former model glowed in a vibrant pink coat which she paired with black sky-high heels and a black belt around her waist to compliment her figure. What do you think of Melania’s latest outfit choice?